I can’t tell you the number of times that, in our seemingly never-ending struggle with debt, that I’ve seriously contemplated just giving up. Just throwing in the towel and saying f-it. You know it’s bad when you catch yourself fantasizing about it. About how much easier your life would be without the struggle. Just declaring bankruptcy, taking the hit on your credit score, and moving on with your life. Even now, after having written about personal finance for over five years, I still find myself in that place occasionally. We let our budgeting lapse, and inevitably our spending gets out of whack again. Something happens, and the emergency fund just doesn’t seem to cover it all. Or, worse, doesn’t seem to replenish itself as quickly as it should. I can try and lay the blame somewhere. That always helps, right? If it isn’t my fault, then I can’t be blamed for it. I can’t be the one that everyone points to as the failure. I can deflect that attention to someone or something else. That helps. Until it doesn’t. Every single time, it’s really me that deserves the blame. It wasn’t the boss that refused to give me a raise. It wasn’t the heater in the car that needed to be fixed. And it certainly wasn’t the kids that needed to eat. It was me. Every. Single. Time. I failed to negotiate the raise. I failed to have enough saved up to make that repair. I failed to budget properly to make sure that we wouldn’t have to cut corners at the grocery store. Me. I did that. I could just give up. 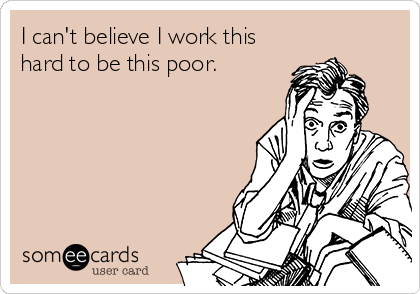 I could miss having to work harder to be paid appropriately. I could miss having to pay attention to my budget to save money for car repairs, or to pay for groceries. I could do that. Giving up would be so easy. Great attitude! It’s so easy to blame others when the world doesn’t do what we want it to. It’s so difficult to take that step back and recognize that you are responsible for your experience in life. After all, you can’t control what happens to you. You can only control how you respond to it. ‘7 Habits’ book first taught me about becoming personally responsible, with the whole ‘circle of control’ / ‘circle of influence’ stuff… and I kept running across it in my success & entrepreneurship reading. Ramsey refers to it as a maturity issue. Same message, over and over again. Yet so many still cling to a reactionary or victim attitude, like they aren’t the captains of their own ship. PS – Glad to see you put your picture on the site. UGH! I am so guilty at wanting to blame the circumstances! But you’re right, that only goes so far. I always feel that as long as God gives me another day of breath, it’s a chance to do better than the day before. It certainly easy on a long treachorous journey to wanna give up, to lay the blame somewhere else but in the grand scheme of things, I think the best thing is to keep trying, keep taking those baby steps and find the brighter side to debt. As you’ve poignantly put it, all is not lost. Have to say, as an observer and blogging friend I think you’re approaching this the best way. Yes, we have to be honest with our frustrations – and yes, we’re ultimately responsible for handling it the best we know how.